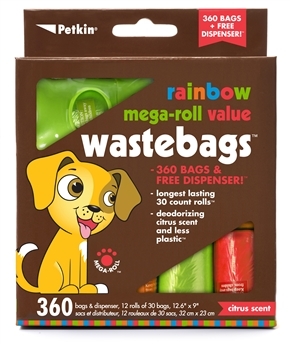 360 bags & dispenser, 12 rolls of 30 bags, 12.6" x 9"
Mega-roll dog waste bags are the longest lasting bags with an amazing 30 bags per roll, that’s twice as many compared to ordinary rolls, so they last twice as long! Now you can always be ready to pick up after your dog and never caught empty handed. 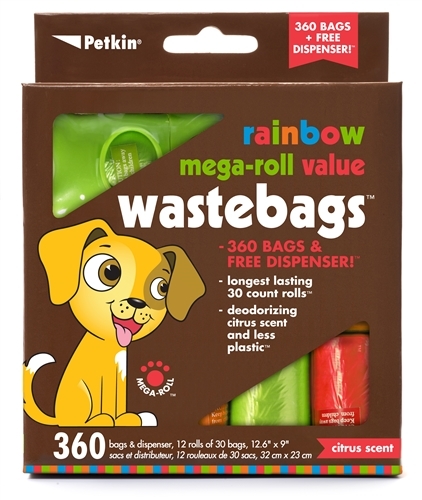 Mega-roll dog waste bags are super strong, leak proof, deodorizing and freshly scented. Fits all standard size dispensers. 360 bags & free dispenser! Use with mega-roll dispenser or with any standard size roll dispenser. When dispenser is empty, twist open and refill with a new roll of bags, close dispenser and pull first bag through opening in center to get started again.